My name is Natan and I'm from Israel. First of all, I apologize for my english - I might have some (or many) misspellings. I must say, I really love your product. it's beautiful and useful, and I definitly love to use it. 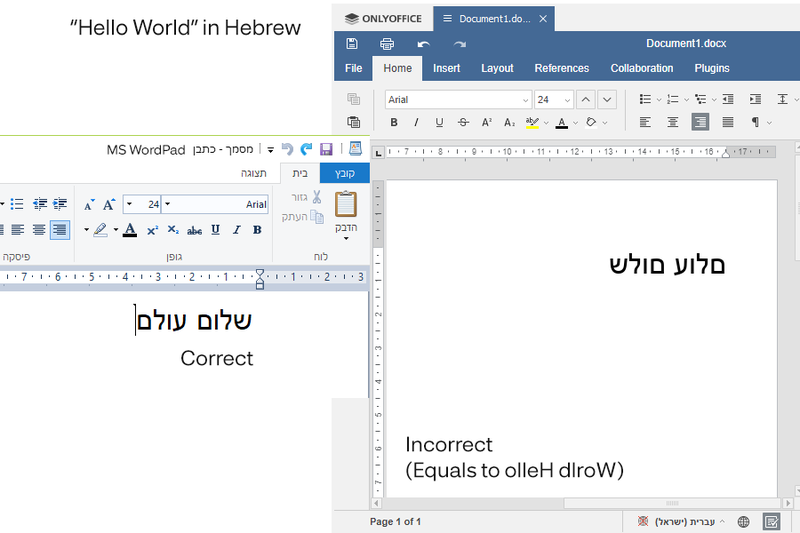 but - I've noticed a problem, which is big when you try to type in hebrew: Letters are shown in reverse. I've attached an PNG file to show you what I mean. It also happening when you export the file to pdf. I hope you'll be able to solve this. Thank you very much for this great product. Also - If you need help to support this program to hebrew, I'd like to help. Thank you for your feedback! We will take it into account. I've searched the Internet and found out that other users had complaints about this issue, even two years ago. Is it going to change? We know about this issue. We understand that it is very important to implement RTL option. Unfortunately but i cannot say when it is going to be implemented in Onlyoffice. I must say that I am very disappointed. I really love ONLYOFFICE and it's, in my opinion - the best open source office solutions. But - it's the best if you ignore this huge disadvantage, which hasn't solved yet for 2 years (or more? I don't know) and simply isn't friendly for Hebrew (/Yiddish) and Arabic speakers. You say the same thing that others said before - Nobody can know if and when it will support RTL, but still you also aware to the fact that it's important. Anyway, I hope one day you'll support RTL. even in the next 2 years. better late than never. Thank you for your open feedback. We really understand how RTL is important and i hope that Onlyoffice will get that feature this year. Missing this feature is making things very challenging for many people and may different parts of the world. Just wondering if there are other reasons for ignoring this feature?